I’m still kind of exhausted from the effort (see yesterday’s post) of completing our survey of some of the many unexpected ways that the newly discovered Higgs particle might decay. But I would be remiss if, before heading off into the holiday break, I didn’t issue some well-deserved congratulations. 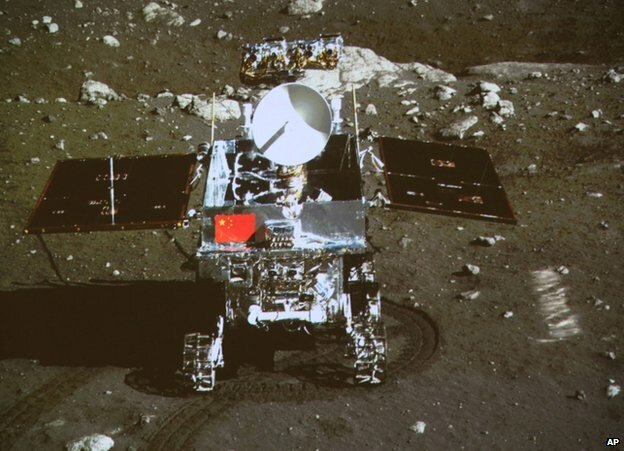 Congratulations, first, to China — to the scientists and engineers who’ve managed to put a lander and a rover on the Moon. If you think that’s easy… think again! And they succeeded on their first attempt, a real coup. Now let’s see what science they can do with it, exploring a region of the Moon that apparently may offer answers to important questions about the Moon’s history. Specifically, by accident or by design, the rover is going to be able to explore an area of considerable geological importance, involving one of the Moon’s giant lava flows, a relatively young one (1-2.5 billion years rather than 3 billion or more). 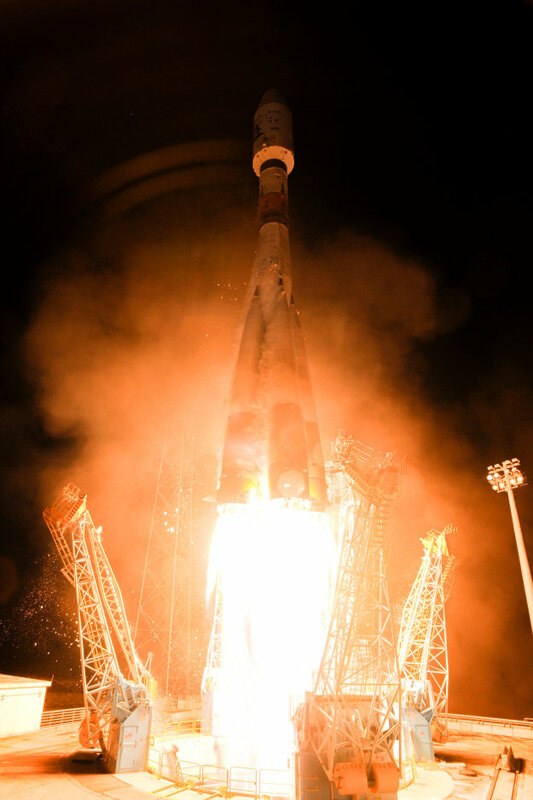 Congratulations, next, to the scientists and engineers of the European Union, who’ve put a fantastic telescope into space, destined to orbit the sun. The Gaia mission is aimed at doing the extraordinary: mapping, with ultra-high precision, the locations and motions of no less than 1 billion stars within our galaxy — nearly 1% of the total number. The distance to each of these stars will be determined by parallax — looking at how the positions of stars wobble, from the perspective of the spacecraft as it orbits the sun — and the real motions of the stars will be determined by how they drift across the sky, and by the Doppler effect for light. This wealth of information will help scientists figure out the shape and history of the galaxy to a degree never previously possible. Meanwhile, Gaia will also be able to do a lot of other science, picking up distant supernovas outside our galaxy, nearby asteroids orbiting our sun, and signs of planets around other stars, as well as brown dwarfs (small failed stars) that may be floating around between the stars. Gaia can even check some aspects of Einstein’s theory of gravity! Read here about all the wonderful things this mission can do. Congratulations also to the scientists and engineers in Iran, who’ve apparently moved their rocketry program, and its potential application to human space flight, among other things, another step forward. A second monkey has made the trip to the edge of space, a suborbital trip. (Did the first survive? it’s not clear, and admittedly Iran is known for photo-shopping reality into supporting the story it wants to tell. Not that it matters; it took the US several tries, back over 60 years ago, before a monkey survived the trip, and the survival rate continued to be poor for a while. ) Anyway, it puts Iran well on its way toward its goal of a human in space by 2018. And finally, congratulations to my own country, the United States, for having passed a budget deal. Not out of the woods yet, but at least it was bipartisan, and we’re not yet talking about another damaging government shutdown, or worse, default. Politics isn’t rocket science. We’ll have to hope our politicians can learn something from China: that it’s good to find some common and worthy goals to work toward together, rather than to fight about absolutely everything and bring the nation’s operations to a halt. Informal conversations hosted by science writers Alan Boyle, Tom Levenson and Jennifer Ouellette, who explore the explore the often-volatile landscape of science, politics and policy, the history and economics of science, science deniers and its relationship to democracy, and the role of women in the sciences. Sean Carroll is a Caltech physicist, astrophysicist, writer and speaker, blogger at Preposterous Universe, who recently completed an excellent and now prize-winning popular book (which I highly recommend) on the Higgs particle, entitled “The Particle at the End of the Universe“. Our interviewer Alan Boyle is a noted science writer, author of the book “The Case for Pluto“, winner of many awards, and currently NBC News Digital’s science editor [at the blog “Cosmic Log“]. Sean and I were interviewed in February by Alan on this program; here’s the link. I was interviewed on Virtually Speaking Science once before, by Tom Levenson, about the Large Hadron Collider (here’s the link). Also, my public talk “The Quest for the Higgs Particle” is posted in their website (here’s the link to the audio and to the slides). There is no room for politics when we are playing for keeps. So say four Republicans, who served four Republican presidents as heads of the Evironmental Protection Agency. The climate is changing in Washington D.C., though still more slowly than in the Arctic. My own view? Our uncontrolled experiments on our one and only planet must be curbed. Scientific evidence from many quarters show definitively that the Earth is warming. Science can give us arguments, strong but not airtight, that we may be responsible (mainly via carbon emissions, and the greenhouse effect of carbon dioxide). It cannot tell us reliably how bad the risks of a warmer Earth will be; there are too many uncertainties. But it seems to me that these are risks we shouldn’t be taking, period. We don’t get to mail-order another planet if we mess this one up. Sean Carroll is a Caltech physicist, astrophysicist, writer and speaker, one of the founders of the blog Cosmic Variance, who recently completed an excellent popular book (which I highly recommend) on the Higgs particle, entitled “The Particle at the End of the Universe“. Our interviewer Alan Boyle is a noted science writer, author of the book “The Case for Pluto“, winner of many awards, and currently NBC News Digital’s science editor [at the blog “Cosmic Log“]. I was interviewed on Virtually Speaking Science once before, by Tom Levenson, about the Large Hadron Collider (here’s the link). Also, my public talk “The Quest for the Higgs Particle” is posted in their website (here’s the link to the audio and to the slides). Fig. 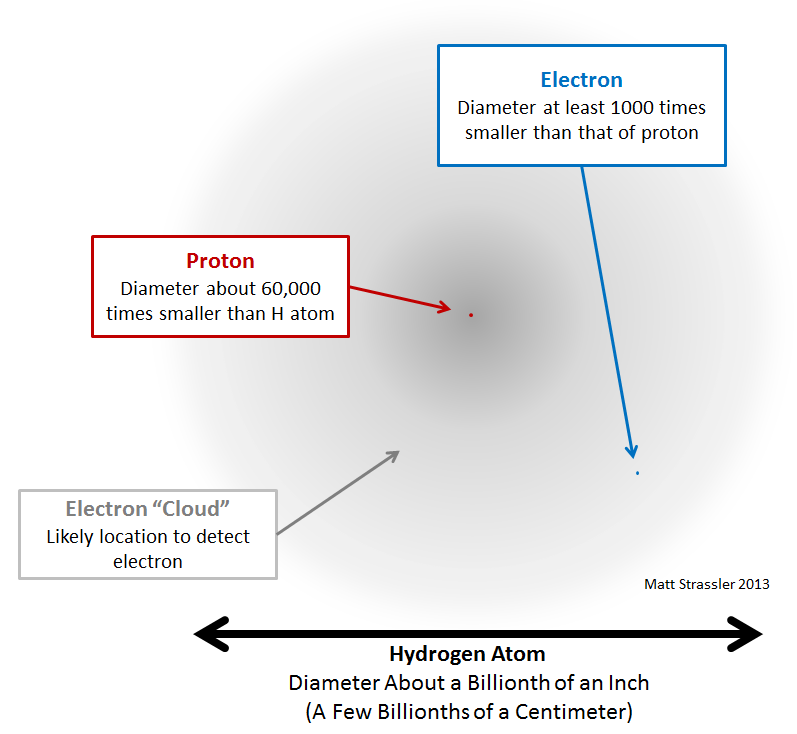 1: A hydrogen atom consists of a tiny proton “orbited” by an electron. Dark Matter Around the Corner? The meaning of the title of Clara Moskowitz’s new article for the public, “Dark Matter Mystery May Soon Be Solved“, all lies in the word “may”. It may. It may not. I have to admit that this kind of phraseology, which one often sees in the press in reports about science, drives me a bit nuts. Which scientists? How many of them? You can’t tell from this line whether this is something that a group of three or four mavericks are claiming, or whether it is conventional wisdom shared by most of the community. And “the answer… could come…”? Interpreted literally it is content-free: yes, the answer could come in the next few years, or not — but you don’t need any scientists to tell you that. If one interprets it more optimistically — that it is intended to imply that the answer will very likely come within the next three or four years — then I think it is far from clear what fraction of the experts will agree with that statement. Just ask the Nobel Prize committee: is quantum physics some sort of speculative new science? (A smart educated woman asked me, just a week ago, `What do you think about that quantum physics stuff?’, as though it were in the same category as theories of consciousness, speculations about the origin of life, and string theory.) No way: it’s all over your computers and cell phones; it’s in many modern light bulbs; it’s the laser that reads the prices at the grocery store and your ticket at a concert; it’s the heart of the best timepieces and the eyes of the best microscopes; it’s what makes solids solid and liquids flow, and powers chemical reactions and radioactivity; it’s probably playing a big role in biology that we’re just starting to understand; and it’s sunshine and moonlight and the glowing auroras borealis and australis. It’s the foundation and fabric of your world. And though it may be bizarre, it is by no means abstract. Maybe in the early 1930s one could still say it was abstract; but already for many decades particle physicists have passively observed individual particles, one at a time, behaving in quantum mechanical ways. Today scientists can control individual quantum objects, things whose behavior can only be predicted by accepting the odd rules and counter-intuitive implications of our quantum world. 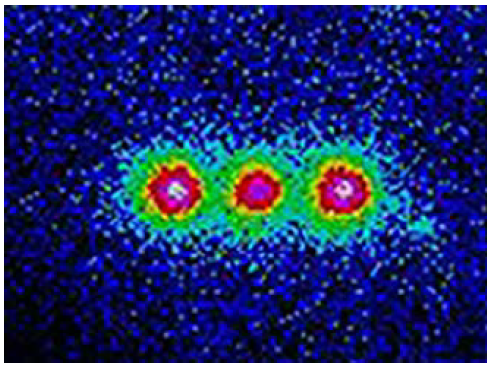 In particular, physicists have learned to capture and manipulate individual photons (particles of light), atoms, and ions (atoms with an electron removed or added, to make them electrically charged — see the Figure below.) It is for their work advancing these capabilities, making possible new classes of experiments and opening up the potential for new technologies, that Serge Haroche and David Wineland have won the Nobel Prize for 2012. Read about it here (brief press release or summary for non-technical readers)… using your preferred quantum-mechanical device. The promised follow-up article on the workshop last week in Waterloo, Canada will have to wait til Monday; I had too many scientific activities and chores to take care of today, and I want to make sure the article, which is a bit complicated, is nevertheless clear. But in the meantime, let’s celebrate Martian Curiosity! First, a big congratulations to the NASA folks! Very impressive, and fantastically cool. I was a huge fan of the Spirit and Opportunity rovers, especially of their 3D photography. Looking at those photos on a big screen, through red/green 3D glasses. brought me to sweeping Martian vistas and deep Martian craters — as vivid and as close as I’ll ever see them. It was amazing stuff, and I look forward to more from the new rover.